Therefore, the sum of such quantities as obtained by dividing the heat absorbed reversibly via the temperature is zero over a complete Carnot Cycle. Here, dqrev is the heat absorbed reversibly at a temperature in an infinitesimal step in the cyclic process and Δ is the integral over a whole cycle. Now consider a system going in the reversible manner from an initial state 'A' to an intermediate state 'B' and then back to 'A' through the other path (figure shown). This cyclic process can be broken up to a large number of Carnot cycles. Beginning from 'A' and following all these cycles we might reach 'A' once again. The paths within the figure cancel out each other and just a zigzag path is left). The bigger the number of Carnot cycles, the closer will be the resemblance between this zigzag path and the overall path ABA. Let us associate the changes in internal energy and enthalpy to entropy change. Equation dU = nCv‾dT = TdS - pdV and dH = TdS - pdV + pdV + Vdp = TdS + VdP are the joint mathematical statements of the first and second laws of thermodynamics. The first law of thermodynamics is mainly concerned by the conservation of energy and the second law of thermodynamics introduces the theory of entropy. This signifies that the entropy change in a system is to be computed by supposing the process to be reversible, irrespective; of the fact that the process is reversible or not. We are now interested in determining the entropy change in an isolated system where cyclic processes of isothermal expansion and compression occur. 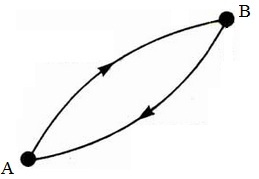 These cyclic processes can take place in two ways; one in which both the expansion and compression are reversible and the other, in which one is irreversible whereas the other is reversible. Let us take an isolated system comprising of a cylinder that contains a gas between it and a smooth air tight piston and is put in a heat reservoir. Assume that the gas undergo isothermal reversible compression back to its original state. Suppose that throughout this compression, heat lost from the system and the heat gained via the reservoir are both reversible. 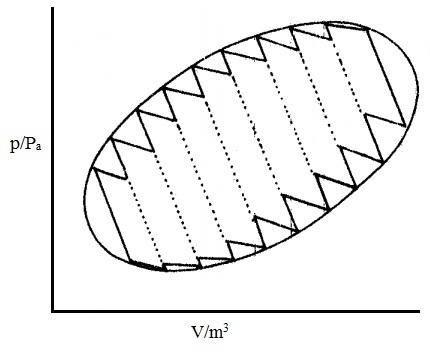 Then, the total entropy change (ΔSb) of the isolated system illustrated above, throughout reversible compression, is as well equivalent to zero. This signifies that the total entropy change in the Reversible cycle is zero. Let us now observe how the entropy changes in the cyclic process comprising an irreversible phase. Assume that the gas undergo isothermal irreversible expansion from a volume V1 to V2 at a temperature T. In this process, let us suppose that the gas absorbs heat 'q' irreversibly while the reservoir loses the similar heat reversely. Though, the entropy change of the system (ΔS1) is still represented by the equation per definition. The first law: The energy of the universe is constant. The second law: Entropy of the universe is tending to maximum. 1) The entropy of an isolated system tends to rise and reaches a maximum. This means that the most stable state of an isolated system is the state of maximum entropy. As the universe might be considered as an isolated system, it follows that the entropy of the universe for all time rises. 2) It is not possible to transfer heat from a cold body to a hotter body without doing some work. This was hypothesized by Clausius. 3) According to Kelvin, it is not possible to take heat from a source (that is, a hot reservoir) and convert all of it into work via a cyclic process devoid of losing some of it to a colder reservoir. In common, the entropy change of the system is stated by the entropy of the final state (B) minus the entropy of the initial state (A). This is equivalent to A∫B dqrev/T which at constant temperature can be represented as 1/T A∫B dqrev = qrev/T, here qrev is the net amount of the heat absorbed reversibly in the process. Therefore, to compute the entropy change of an ideal gas throughout isothermal expansion or compression, n, V1 and V2 or p1 and p2 should be known. The adiabatic expansion comprises no heat change that signifies ΔS = 0 for the system. Here, CV‾ is the molar heat capacity of the gas under constant volume conditions. This is the case when we take T and V to be the variable quantities. As for an ideal gas p, y and T are associated by the ideal gas equation, only two of these are independent Variables. Therefore, by using the above equations, we can compute the entropy change of the ideal gas whenever its pressure or volume changes due to the temperature change.